If you look at some current national and even local media reports, you would come to believe that Central Appalachian coal is in a long-term decline – one that is the result of a depleted reserve base and the impact of vast amounts of low-priced natural gas entering the market. This assessment is superficial and amateurish and it ignores the reality of the core economics of coal, gas and oil in the marketplace and the long-term sustainable relationship of those fuels in electric generation. First, natural gas IS currently cheaper than coal in the marketplace. The current price of natural gas on the Henry Hub is about $3.90 per million btu compared to the price of coal, which is about $2.25 per million btu. Recently, the price of natural gas has been as low as $1.10 per million btu. It has trended higher in recent months, but has once again started to trend downward over the past few weeks. 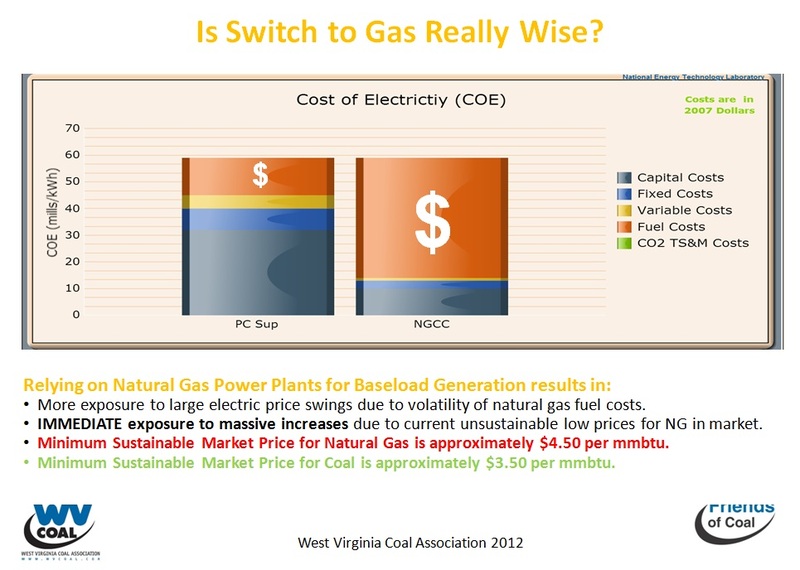 At the low end of this price structure – due to the relative total cost of natural gas versus coal-fired electric generation – it would superficially appear to be economic to shift long-term electric generation to natural gas, but you have look beyond the surface – something you are clearly not doing. To make a sound decision, you have to look not only at CURRENT price but also at price volatility and at the minimum sustainable market prices of the various fuel types. When you incorporate all those factors into the assessment, you find that the picture shifts back to strongly favor coal. First, looking back at the current price structure and comparing it to the sustainable market prices (the minimum price level needed to support the production of the good in the market place) we find that even at the current price of $3.90 per million btu (fully $2.80 above recent lows), natural gas is still significantly below the minimum sustainable market price (MSP), which is by the industry’s own estimates around $4.50 per million btu. Coal, meanwhile, even at the current depressed market prices, is trading above its MSP of approximately $2.00 per million btu (a price level of approximately $50 per ton for Central and Northern Appalachian coal). Now, when we add the historic price volatility to the assessment we find that natural gas has seen wide price swings over the past 20 years – from highs of nearly $15 per million btu to the recent lows of $1.09 per million btu. By comparison, coal has traded in a much narrower, much more predictable range of between $1.90 and $3.20 per million btu. The average market price for the past 20 years for the two fuels is approximately $8 per million btu for gas while coal’s average price is approximately $2.60 per million btu. Now, when you consider that fuel cost alone accounts for approximately 70 percent of a natural gas electric plants annual operating costs but only about 20 percent of a coal-fired plant’s annual costs, a good CEO would quickly come to the realization that making such a switch is economically unsound. Now, the data analysis is admittedly a bit of a sleeper … but the bottom line is this — switching to natural gas at the current price structure as the primary electric generation fuel is essentially locking in a huge inflation factor for the end user (the consumer) in the short and long term. The truth of this was recently borne out by the PGM auction of transmission capacity – which saw huge increases of as much as 800 percent on the stated basis of pricing the switch to gas into the market. By the way, in case you don’t know, PGM is the “real electric company” – they own the transmission capacity for the eastern U.S. So, if it is uneconomical, why is this switch to natural gas happening? It is happening because of the policy decisions coming from the Obama EPA – which is leading to both fuel availability uncertainty (they are not issuing coal permits) AND forcing the retirement of existing coal-fired capacity (28,000 MW) that is unable to meet the new, draconian standards imposed by the Obama Administration in its single-minded pursuit of all things green. One thing to note is that NO ONE IS BUILDING NEW GAS GENERATION CAPACITY – they are simply swinging existing gas-fired “peaker” plants into use as they displace coal capacity. The companies may be using more gas right now (even that is beginning to shift back to coal) but they are NOT making the significant investment in NEW capacity nationwide. Now, on the subject of generation capacity, I saw last year a news release by the Sierra Club in which it claimed “victory over 100 coal-fired power plants over the past 10 years.” They claimed to have stopped construction or shut down 100 coal generation facilities over the period. But this “victory” by the Sierra Club was no victory for America. Looking at the permits for these facilities, we found that these plants would have used 170 million tons of coal per year (essentially the production of West Virginia plus a few tens of thousands of tons). If we take the average tonnage of coal produced per coal miner per year in West Virginia as the definition of a full-time equivalent job, we find that this victory cost approximately 20,000 direct coal mining jobs and another 80,000 support and indirect jobs – 100,000 TOTAL JOBS LOST TO THE ECONOMY because of this “victory” for the Sierra Club. But I digress, the point of all this is that when you strip away the issue to the most basic level – the decline in coal production, the job losses in coal mining and across the economy to companies like Joy Equipment, NS Rail, CSX Rail, Caterpillar, etc, etc, — the unemployment that is now becoming a pandemic across Appalachia – can be laid squarely at the feet of Obama and his allies in the radical environmental movement, who care more about pursuing the fiction of a “green economy” than pursuing real jobs for American families. « Method of Mining: Why is Mountaintop Mining chosen over other methods?